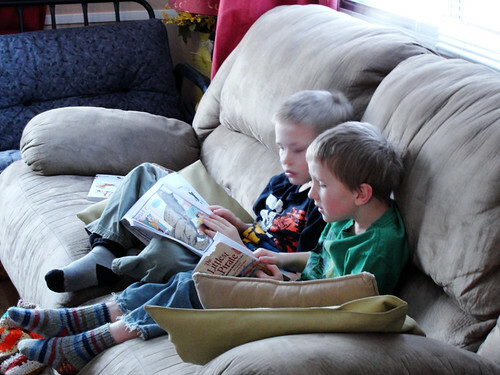 Here are my two home-schooled boys, sweetly and quietly reading to themselves on the couch when I came out for breakfast this morning. He sure likes to read, that kid! I think he wants to catch up to his brothers! On Friday, these two munchkins and I were out-and-about for most of the day, and by afternoon, I was flagging. (I had had a difficult time sleeping the night before--I"m pretty sure my dog had something to do with it.) Fortunately, I discovered an unclaimed "Free Coffee" I had won from Tim Horton's "Rrrroll up the Rim" contest lying around in the van. "When I'm an adult, I am going to win a free coffee, and live in Peace River." "Really?" I ask through my stifled grin, hoping to keep him rolling. These conversations usually turn into gems, and this one didn't disappoint. Before Noah could answer, Jabin interjected his two cents. "When I'm an adult, I'm going to live in Red Deer!" "Why are you going to live in Peace River?" I ask Noah, thinking it would have something to do with being close to us, or his friends, or our house. Nope. "To be close to Dairy Queen." But they weren't done, yet! "Well, Noah, I guess you'll have to see. Every family is different, and maybe you won't have a reason to limit it to the weekends, like we do." I wonder if he knows that HE is the reason we limit it to the weekends? I think to myself. "When I'm a dad, I'm only going to let my kids play video games on the weekend, but they can play on the laptop [meaning internet games] or on my phone [meaning downloadable games] any day when they are done school," piped up Jabin. I guess he figures our rules aren't as constricting as Noah does. "... And the weekend days will be Thursday, Friday, Saturday, and Sunday!" Either my grandchildren are going to be ignoramuses, or Jabin is going to be Prime Minister. OK....so here's try #2 at leaving a comment!